Hi guys, just wanted to share this personal selection of H&M polishes with you, wouldn't they make a cute fall collection? :) Have a great night! Yes they would make a good fall collection! I would love to buy these! wish i had the fourth one! amazing! These would make an awesome fall collection! Wish I had looks great on you! @Sandra - Essie has DaBush that is close to Hunt Me Down. 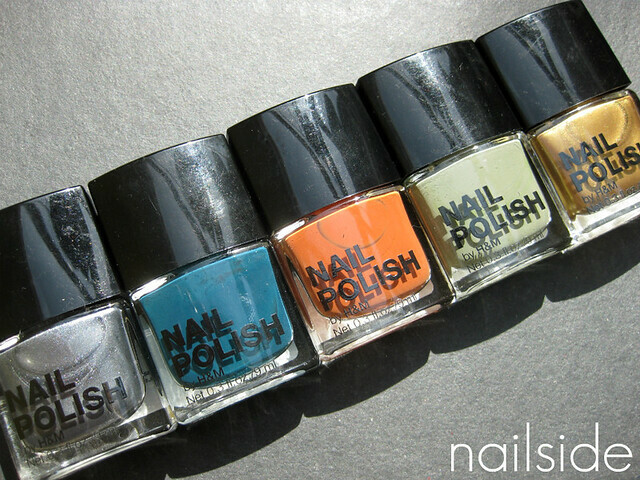 It was part of this summer's Essie Resort Collection and all over eBay. I like to layer it over another Essie Sew Psyched now part of their classic collection but was out as part of Essie Fall 2010. I will mix the two sometimes as well on a piece of foil and paint them on that way. The only one I have is Hunt me Down, a very special colour. Are Nice 'n Naughty and Golden Treasure new ones? Thanks guys for sharing your thoughts and tips! @marox79: Yes, they are :) So still available in stores, at least here in the Netherlands or online on their website.